Hereford United supporters are looking to get their planned takeover of the cash-strapped Conference Premier club wrapped up by the end of May. The Hereford United Supporters' Trust (HUST) has now made an official bid to take over the running at Edgar Street. "We could be looking at doing a deal inside the next four weeks," HUST vice-chairman Martin Watson told BBC Sport. The Bulls have debts of £220,000 due at the end of May, including an £80,000 tax payment owed to Revenue & Customs. Despite averting the threat of a winding-up order in early April for the second time this season, Hereford could still go into administration. But Watson is confident that they can not only find the £220,000 to clear their debts, but still have sufficient funds to make the club financially sustainable. "The total's a good six-figure number," Watson told BBC Hereford & Worcester. "We are more or less at the point where we could say we could go in and take the club forward. "The decision is entirely down to the board. The indication that I've had is that they're open to discussion." The mood among Hereford fans is now buoyant following Saturday's remarkable relegation escape when, at grounds 230 miles apart, two goals went in almost simultaneously to send Chester back down to Conference North and keep the Bulls in the Conference Premier. 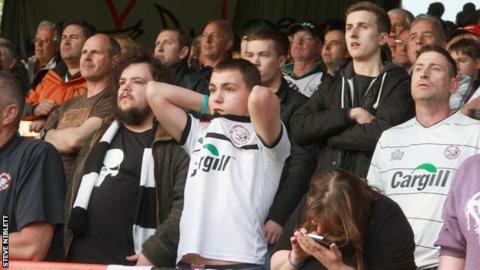 But, no matter who holds the reins at Edgar Street, the financial situation remains grim. And, before taking over the club, following chairman David Keyte's warnings that the Bulls are still not hitting their budget (based on home attendances), the HUST wants to be assured that it is not going to be saddled with further unmanageable debts. "The big thing now is working out, not so much getting past the next six weeks, but how we deal with the upcoming debts after the next six weeks," added Watson. "Even though this season is over and a large amount of the players' wages have stopped with contracts ending, the bills will continue. "We have to work out a plan. There's no sense in throwing money into a black hole, to hit another wall in a couple of months' time." In the event of the club going into administration, the subsequent 10-point deduction is now expected to be implemented for next season, after the Conference's Annual General Meeting in six weeks' time, rather than affecting the campaign which ended on Saturday.